Perhaps you only need to look at the poster for The Veteran to realise that it’s riddled with tired clichés. The latest post-Afghanistan war film to hit our screens should be applauded for its efforts to depict the traumatic experiences that PTSD (Post Traumatic Stress Disorder) will inflict on a generation of young men. However, the effect is lost in a myriad of wooden performances that fail to resuscitate a predictable plot. 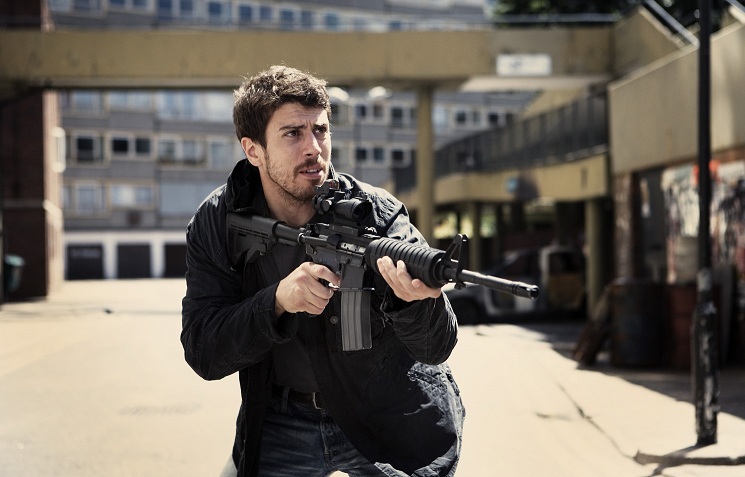 The film begins with protagonist Robert Miller (Toby Kebbell) returning from service in Afghanistan. Shocked and appalled by the behaviour of gangs in south London, he decides to hook up with a former soldier and begins a quest to clean up the streets. He also begins working for an undercover security firm headed up by Gerry Langdon (Brian Cox CBE), who stereotypically plays a maverick government agent. Predictably, sticky situations result from both endeavours. Miller begins to fall in love with an informant he’s monitoring named Alayna (Adi Bielski) and bites off more than he can chew when trying to contain a violent gang, resulting in one of the most violent and ridiculous endings I’ve ever seen, which lacked the intelligence of films such as Taxi Driver or even Harry Brown. There appears to be little chemistry between Miller and his old army pal, Danny (Tom Brooke) which seemed surprising considering the gritty origin of their friendship. Instead of offering depth, the usual clichés associated with modern war films appear, including against-the-odds fight scenes and the unearthing of dubious conspiracy theories. Throughout the film, Miller is plagued by symptoms of PTSD, be it sporadic insomnia or hearing the sounds of warfare in his head. The skills he picked up on the battlefield are utilised to great effect in the films numerous fight scenes. However, Kebbell’s acting is unconvincing, meaning that you feel little empathy when he struggles with the disappearance of Alayna (Adi Bielski). In fact, most of the characters deliver lacklustre performances which fail to bring to life what could have been an engaging subject matter.